So since I just posted about google I thought that I would just kill two birds with one stone post about my progress for my practicum project. Just a reminder my topic was support groups and I was interested in focusing how online forums, like support groups, really can become a virtual community. Again, I am now in a “loss of a pet” support group. Today I posted a funny story about one of my old dogs—it was about how once I was letting him out to go to the bathroom and he ran into my neighbors house and ate pancakes off their kitchen table (I went into more detail for my group). So it was basically just a funny story I thought off and everyone really loved it and was super touch. I had three people actually say that the story made their day…kind of cool when I think about it. Anyway just thought I would share about this experience today. After being slightly discouraged from Chathour, I decided I needed to return and play along a little in order to get anywhere in my research. 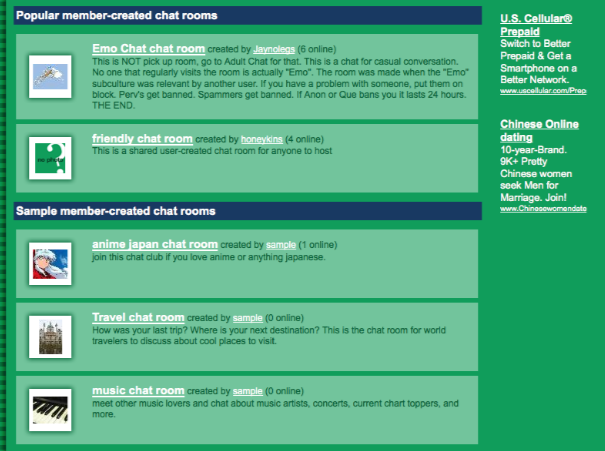 The variety of chat rooms is quite interesting, there are user-created chat rooms such as “friendly chat” or “emo chat.” There are also chat categories like “Lesbian chat”, “Asian chat”, “Music chat”, “New York chat”, “Christian chat”, “Heartbroken chat”, etc. One could have access to any of these chat rooms, as long as you behave yourself and aren’t kicked out (yes, you can be kicked out of a chat–I know from experience). People can post chats that they created in already existing chat rooms, to invite people to a more exclusive chat. Many people in the chats throw around terms that I am not yet familiar with, but I do plan to do more research. People ask me to “C2C” or “PVT” and each time I decline because I still do not know what that means! I will definitely figure it out soon and delve deeper into chat hour.